Rome has a reputation as the ‘patriarch’ of European capital cities for its ability to promote and popularize culture. Its pre-eminence rests to a large extent on the quality and diversity of its art. Not only do its galleries and museums have outstanding collections on permanent display; these are supplemented by temporary exhibitions devoted to the life and works of individual artists from Italy and abroad. The year 2006 was no exception as it was marked by a series of first class exhibitions, beginning with the most significant, which featured classical Italian masterpieces from the Renaissance period. Exhibitions of works by Antonello da Messina were on display from the 18th of March to the 25th of June 2006 and those of Raffaello Santi (Raphael) from the 19th of May to the 10th of September 2006. They shared a common denominator, in that they followed a pattern that has been increasingly used by curators over the last few years. The works of a given artist are featured as the central focus of an exhibition. These are then “framed” within the exhibition space by works of other artists who are connected with the main protagonist – in style, spirit, time or direction. This provides a perspective on the creativity of the main artist, giving greater understanding of his outlook and the formal qualities of all the works on display. This model was used for the largest sole retrospective of the last few decades – the exhibition of the Sicilian master Messina at Le Scuderie del Quirinale, the former papal stables which were converted several years ago into a prestigious complex of exhibition halls, opposite the Presidential palace on the Quirinale Hill. This exhibition in Rome was one of the most interesting representations of the Venetian school – which exported across the Apennines a number of stylistic and technical features from paintings of the Northern Renaissance. This theme became a significant feature of international exhibitions during 2006. The success of this exhibition was shared by a display of canvases from Raphael’s Florentine period (1505 to 1508), which was presented in the halls of the Galleria Borghese and surrounded by canvases of his contemporaries. There were 60 paintings in total, drawn from many international museums, some of which have never been exhibited in Italy before. The same approach was used for the retrospective exhibition of one of the greatest Italian painters of the second half of the 20th century, Alberto Burri, who was a colourful member of the Abstract Expressionist movement. The exhibition of his works occupied the halls of the Scuderie del Quirinale until the 16th of February 2006, a date chosen to coincide with the 10th anniversary of the artist ’s death. The exhibition included more than 80 works by Burri himself and others by his contemporaries. Other exhibitions on display were just as interesting even though they did not adopt the curatorial approach described above. More traditional methods are applied in the Complesso Vittoriano (housed in the monument to Vittorio Emmanuele) in the Piazza Venezia. A part of this national memorial has successfully served as an extremely convenient repository for many prestigious art exhibitions over the years. It is worth mentioning two of the most successful: from February to August 2006, Modigliani (dozens of works tracing the painter ’s entire artistic career); from October 2006 to February 2007, a “paired” retrospective of Matisse and Bonnard: over 200 paintings, drawings, sculptures and documentary material comprehensively covering the life and creative output of the two post-Impressionists and their friends. There were also works by Klee drawn from collections in Paris, Berlin, and New York in the galleries of Palazzo Ruspoli from October 2006 until January 2007 and 80 collected works by Andy Warhol in the Galleria Bramante from October 2006 to January 2007, which celebrated the gallery ’s first 10 years of activity. Co-incidentally, it was an exhibition of Warhol that originally opened the gallery. For six months, from April to October 2006, the preserved antiquity the Hadrianeum (Hadrian ’s Mausoleum) on the banks of the Tiber, was occupied by a “Baroque Rome” exhibition which featured more than a hundred sculptures, paintings, drawings, sketches and drafts by the masters of Roman baroque: Gianlorenzo Bernini, Francesco Borromini and Pietro da Cartona. Between April and July a sequence of three brief exhibitions each featured just one painting: the Galleria Nazionale d’Arte Antica in Palazzo Barberini took delivery, from Amsterdam, of the “Love Letter” by the Dutch genius Vermeer. Secondly, the Pallavicini family Palace opened its doors for a few days to anyone interested in viewing the Rubens masterpiece “Christ and the Twelve Apostles,” and thirdly, the Odeskalki knights did the same at their own residence, for viewing of the “Conversion of Saul” by the inimitable Caravaggio. Besides this, the Complesso Vittoriano took delivery (mainly from French museums and collections) of works by my favourite, Claude Monet. The exhibition opened in the autumn of 2005 and lasted until the end of January 2007. The Museo del Corso showcased masterpieces from New York ’s Guggenheim Museum, and featured 90 sculptures and “objects” in bronze, marble, wood, glass, plastic, silver, clay and gold by Umberto Mastroianni (uncle of the great Marcello). During the final months of September 2006, the halls of the Scuderie del Quirinale were taken over by an exhibition on “China: Birth of Empire”. Over 400 exhibits were sourced from 14 Chinese museums, many of which have never been seen outside China before. The majority of the objects date back several thousand years and you could see terracotta figures of infantrymen and cavalrymen, some particularly outstanding for being life size. They lay undiscovered until the end of the 20th Century when they were brought to light during excavations of underground burials of Chinese emperors and military leaders from the First Emperor period, the Qin dynasty of the 3rd century BC. The year would not be complete without photographic art. The previously mentioned prestigious Scuderie del Quirinale selected 61 photographs of the feted film-meister Wim Wenders, shot by him through 20 years of world-wide film-making, with some exhibits five metres in length. The more modest Galleria Bramante exhibited unpublished photographic works and photo portraits by one of the great photographers of the 20th Century, Henri Cartier-Bresson, known to his contemporaries as the “Eye of the Century”. The images were a spellbinding revelation, particularly as all the unpublished works had been shot by him in Rome. Photographs accounted for only a small part of an exhibition displayed in the halls of the Museum of Rome in Trastevere, which commemorated the 30th anniversary of the death of one of the greatest cult figures among Italian film-masters, Paolo Pasolini. A rebel in life, as well as in art – in cinema, in literature, in journalism – Pasolini left an indelible trace everywhere he lived and worked. There is a large body of documentary evidence to support this and the exhibition in Trastevere was yet another superlative affirmation of his works. His films, naturally, were shown during the exhibition. Likewise, film shows inevitably played a part at celebrations in Rome of the life and works of two other great characters of Italian cinema, Roberto Rossellini and Marcello Mastroianni. They celebrated the centenary of the birth of the former, while 2006 marked a decade since the death of Mastroianni. I recall from that time multi-page supplements in all the main newspapers, films and broadcasts on all TV channels, and the tearful faces of people in a never-ending queue to the Municipality of Rome on the Capitoline Hill, waiting for hours to file past the coffin of the great actor. Cinema, in general, reigned in Rome during a series of film festivals. The city hosted five through the summer and autumn months. Four of them displayed the diverse range of film-production within the framework of the annual cultural programme titled “Roman summer.” The fifth, which deserves special mention, is a new official international film festival which, in the opinion of the city authorities, should become a serious competitor to the well-known Venice International Film Festival. Some believe a Rome film festival could dramatically change the character of such events which have turned into essentially “elitist” shows, with no access for a wider, less “well-heeled” audience. It is true that in Venice, and especially in Cannes, prices for any service sky rocket during the film festivals, with the number of seats on sale being limited and entry to post-viewing talks requiring a special permit. In Rome everything was, much more widely accessible “and so it will continue to be” declared Rome’s Mayor, Walter Veltroni, himself a recognized cineaste. Viewings took place in the Auditorium, the largest concert hall complex in the capital, and in a number of the more spacious cinemas. Ticket prices were not unduly high and the performers and film-makers often appeared to the audience immediately after the viewings. The events were also well publicized. Sceptics say all this may well be true, but whether the new “enterprise” can become a worthy competitor to the cult event in Venice, especially as the festival in Rome immediately follows it in October (13th to 21st ), it is too early to say. It seems reasonable to trial a Roman festival to see whether it finds general acceptance. Only then will it be possible to pass judgment on its success or failure. The 2006 “Roman summer” programme came to a triumphant conclusion. Traditionally, it features, in the hot July and August evenings, regular performances by the Teatro dell ’Opera (Rome Opera House) in the Baths of Caracalla. For more than 70 years, since the early 1930 ’s, a summer season of opera has been staged in the open-air, among the majestic ruins of these ancient baths. Each performance is an unforgettable event. A surprise innovation since last season, was the use of computer-generated “virtual” scenery for Verdi’s “Aida”, Puccini’s “Madame Butterfly” and “Turandot” and a number of other operas. Musical events in the capital throughout the year were not limited to the classics. There were plenty of first class events in the fields of pop, jazz and rock music too. Among them, concerts by the tireless Madonna in August at the Olympic stadium and Bob Dylan, who broke a lengthy spell of silence one year ago, in the Main hall of the Roman “Auditorium” on 3rd July 2006, through to double acts by international rock stars like Billy Joel and Bryan Adams in the arena of the Roman Colosseum on the 31st of July 2006. In recent years internationally known stars have been allowed to perform there only once a year. This great privilege has, in the past, been granted only to Sir Paul McCartney and Paul Simon. Well-known rock star Bruce Springsteen, after a year’s absence, appeared in Rome to present his latest album “We shall overcome,” and the most respected saxophone player on the world jazz scene, forever youthful Sonny Rollins, played at the Auditorium on the 10th of May 2006 during his European tour. Not to mention the traditional Rome jazz-festival with dozens of local and visiting musicians performing during the summer months in jazz-clubs, parks and other venues under the starry night skies of the Eternal city. If serious music in the past year came mostly from the works of Russian composers, on the theatre boards of the Italian capital the spirit, texts and characters of the great William Shakespeare reigned supreme. The theatre-goers of Rome were presented with eight complete productions of his plays over the course of the year. In April 2006, the genius bard of Avon would have been 441 years old. This somewhat odd figure was used to number performances at four theatres and fourteen films, produced in different years by different directors: from “Falstaff” by Orson Welles to a relatively recent “Merchant of Venice” by Al Pacino. The Shakespearean festival was a resounding success, especially as a number of performances took place on the stage of a recently recreated Globe Theatre in the park of the Villa Borghese, an exact copy of the wooden building of Shakespeare ’s theatre in London. Outside the range of events from the cultural world were two first-rate international sports events. The month of May sees both the tennis tournament on the courts of the Olympic stadium in Rome, and the spring dressage competitions, staged annually in the parklands of the Villa Borghese. A review theme of special significance to me during the last year was the presence at cultural events in the Italian capital of Russian art and Russian performers. A few words about the 2006 “Russian season” in Rome. It turned out to be extremely varied in the number and type of participants, the multitude of genres and productions, and the quality of what could be seen and heard. We experienced music and films, fine art and ballet, exhibitions, scientific conferences and even practical workshops. Let us begin with cinema, the most popular art genre. Alas Rome cannot brag about its attention to Russian cinema. In the cinemas of the Italian capital and other cities, screenings of Russian films are quite a rarity. Those shown are mainly winners from the international film festivals, especially Venice, or films from Nikita Mikhalkov who has established strong links with local film distributors. These have not until now amounted to much, although there has been a notable change in screenings during the last few years. The New Russian Cinema Festival, an annual event held under the initiative of the Russian Cultural Fund (Mikhalkov again) is attempting to alter this situation. This event features several relatively “fresh” works in different genres by domestic cinematographers. From the 8th to the 12th of October 2006, the “Trevi” cinema, which has traditionally offered space for screenings of Russian films, screened new works by Vladimir Hotinenko, a documentary film “Pilgrimage to the Eternal City,” a feature film “Dot, Dot, Comma” by Andrei Eshpai, and a film-opera “Norma” by Boris Airapetian. As they say; “good things come in small packages”. As far as music is concerned, 2006 in Rome can undoubtedly be considered the season of Tchaikovsky and Shostakovich, as their compositions were performed far more often than music by any other composer. The capital ’s Teatro dell’Opera opened its homage with “Sleeping Beauty” in May, then in October, showed “Swan Lake,” and finished with the “Nutcracker” in December. This last staging brought us the essence of Russian ballet, as the director was Galina Samsova and the principal dancers were Irina Dvorovenko and Maxim Belotserkovsky. The music of Dmitry Shostakovich, the greatest master of the 20th Century, could be heard in the capital no less often. His centenary was celebrated last year by music lovers all over the world. Concerts in two of the most prestigious halls in Rome call for special mention. April became a month of Shostakovich at the same Teatro dell ’Opera, where for three successive evenings, the composer’s music for Shakespeare’s tragedy “King Lear” was performed. A further three evenings were devoted to romances based on the verses of Blok and Tsvetaeva. A month earlier, on the 4th, 7th and 8th of March 2006, under the vaulted ceiling of Rome ’s largest concert and theatre venue, the “Auditorium” (the Parco della Musica), the Rome Philharmonic Orchestra was conducted by the inimitable Mstislav Rostropovich. Shostakovich ’s 8th Symphony and Concerto for Piano, Horn and Orchestra were performed on all three evenings with Michael Rudy and Andrea Lukki as the soloists. At the end of the concert, on each of these three evenings, the 80 year-old maestro walked around the orchestra and personally thanked each musician. This is not something you will often see, especially delivered by such a master as Rostropovich, and, considering that the Roman ensemble is not listed among the world ’s leading symphony orchestras. But it is a general rule, that the great artist and great human being exhibits greatness in all things, even the most ordinary. On a few occasions, works by both Russian composers were performed within the framework of a single concert. On the 3rd of May 2006, they were played by the orchestra of the National Academy of Santa Cecilia conducted by Mikhail Pletnev, and on the 20th of May 2006 by the regional Veneto Philharmonic Orchestra under the baton of Vladimir Ashkenazy. They were also paired on the 19th of October 2006, by the Russian National Orchestra with V. Urovsky conducting. Apart from the Tchaikovsky ballets, the Roman public saw, in April, Stravinsky’s “Firebird,” with Mikhail Fokine’s choreography “reconstructed” by Andris Liepa, and in October, “Cinderella” by Prokofiev. Both productions were from the repertoire of the Rome Opera House. As far as exhibitions are concerned, Rome was the first among Western European cities to become acquainted with a unique presentation of Russian wooden sculptures. It was brought from Russia under the auspices of the International Fund for Humanitarian Development, “Tolerance.” On the 12th of July 2006, the Capitoline museums put on display 57 of the rarest exhibits, illustrating the skills of Russian carvers from earliest times up to the 19th Century. Exhibits were made available from the collections of leading Russian museums, in particular, the Tretyakov Gallery, Rublevsky and the Kremlin Museum. The exhibition was honoured by the patronage of the President of Italy, Giorgio Napolitano. It remained open until the end of October, right up to the timely arrival of another rare exhibition in the halls of the National Library of Rome. This was the opening, for the very first time, of a display of Russian books and other documentary materials from the Library ’s archives. As the largest library in the country, Rome’s National Library has the most extensive collection of Russian books in Italy, with more than 60 thousand volumes. At the heart of the collection are books transferred here from the so-called “Gogol’s Library,” the first to collect Russian language editions of books, and founded by the Russian diaspora of Rome at the beginning of the last century. Other sources are the library of the Italy-USSR Association, where books and printed materials of the Soviet period are collected and private collections of leading Italian slavophiles – Lo Gato, Mavera, Colluchi and T. Napolitano. The exhibition finished on the 5th of January 2007. During this time, within the framework of some of the complementary events held by the organizers, an evening of modern Russian and Italian poetry took place where Moscow poetess Olga Sedakova read her verses. Another rare exhibition from the 12th to the 20th of December 2006 was opened in the previously mentioned Corso Museum. Following a successful run in February at the headquarters of the United Nations, an exhibition “The Church and the spiritual revival of Russia” arrived in Rome. The core of the exhibition, organized by the Department of External Church Relations and the Publishing Council of the Moscow Patriarchy, consisted of photographic materials, church service objects and examples of church art. A special section was devoted to “confirmations” of the presence of Russian Orthodoxy in Rome. Among these a prominent place was taken by a collection of Russian icons provided by Madame Adzaro Marino, who heads Association “Sophia”, and by Professor John Lindsay. 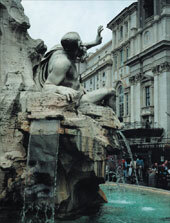 On the whole, relatively few Russian creative artists visited the Eternal City in 2006. Dm. A. Prigov came as a painter to present his works in a showroom of the University of Rome. The writer Mikhail Shishkin came for a particular literary occasion linked to the publication by Rome-based publishing house Voland, of his novel “Venus’s Hair”. However, the ranks of Russian writers in Rome have grown. Among those sighted at literary readings in the capital were, apart from Shishkin who was invited again, A.Kabakov, A.Volos and L. Ulitskaja. Presentations of books by Russian authors started, in fact, at the beginning of the year when in Rome ’s venerable “Antico Caffè Greco,” near the foot of the Spanish Steps, journalist and Pushkin scholar, Alexei Bukalov presented to assembled fellow countrymen and local slavophiles his new book “Pushkin’s Africa”. And still, despite the rarity of the Russian language in Rome, the number and quality of events linked with it here continues to grow. As proof of that we can point to the Week of Russian Language and Culture, held in October in several Italian cities simultaneously. The above mentioned writers came to Rome mainly in connection with this event. The main brunt of the work, however, fell naturally enough on the Russian philologists and teachers who held a series of “open lessons” in the Russian language at a number of Italian universities, in Bologna, Florence and Verona. Apart from that there were also Russian film shows, performances by musicians and discussions of domestic cultural events. The events of the Week in Rome reached a successful conclusion with a great open reception. Everyone present spoke only in Russian, naturally. I only heard reports of it the following day as I was unable to attend. As I could not be present, I shall allow myself to put a full stop right here and move to the final section of my report. A number of noteworthy events took place last year outside the Rome area. Most notably, the first event from September 2005 to January 2006, in Padua, Verona and then in Mantua was the most comprehensive exhibition in history of Andrea Mantegna, native of Padua and a key figure of the early Renaissance. Apart from the works already housed in these cities, the “touring” exhibition totalled 60 works of the master brought from over a hundred museums and private collections throughout the world. The exhibition was linked to the anniversary, marking the Quincentenary of the artist ’s death. Frescoes, pictures, drawings were created by Mantagna mainly in the cities of Padua, Verona and Mantua. They are the origin of many of his most significant works, from murals in the Ovetari Chapel in Padua and the Basilica di San Zeno Maggiore in Verona, to a succession of works of genius, created by the master at the Court of the Dukes of Gonzaga in Mantua, where he spent the last 46 years of his life. The second major event was the opening in Brussels of a new museum dedicated to the well-known Belgian surrealist, Ren Magritte. On the eve of the opening, Belgian representatives of the Royal Museum of Fine Arts and the Magritte Fund brought a collection of the artist ’s work to the Italian city of Como. The opulent 18th century Villa Olmo, on the shores of picturesque Lake Como, exhibited 80 works by this leading 20th century painter for almost four months until the end of July. An accompanying collection of more than a hundred photographs illustrated the key “events” in the life of the artist. “Painting is the visible form that reveals the process of thinking” Magritte used to say. It is unlikely, however, that present inhabitants of these environs which has lately become a hotspot on the property market, are aware of that. The shores of Lake Como, are attracting an ever increasing rush of A-list celebrities from around the world, eager to snap up land and private residences. Hollywood actors are especially strongly represented.